If you are a fan of the air war pulps, or have read some of Age of Aces’ pulp reprints, you have heard the name Sid Bradd. 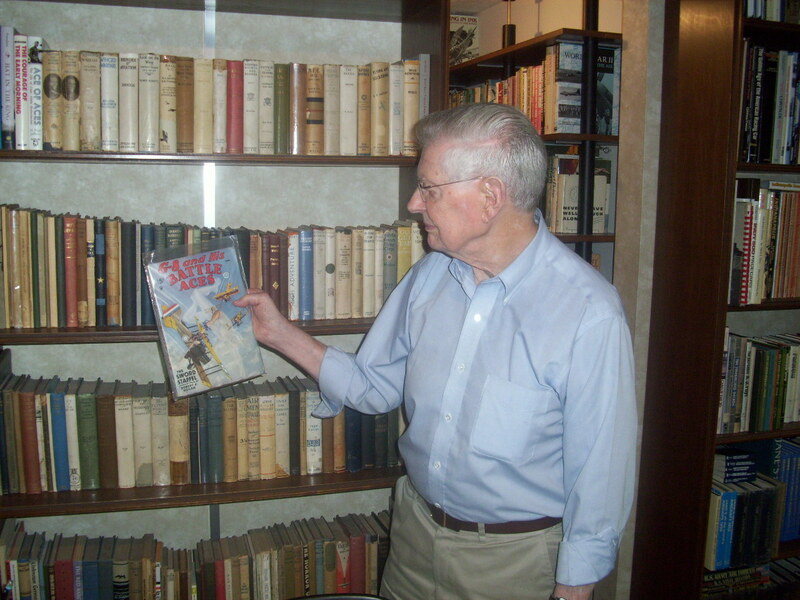 He has been writing articles about the air pulps for over 40 years. Many people know him from his essay in Nick Carr’s The Flying Spy, which detailed the life and adventures of G-8 and His Battle Aces. He was a supporter and contributor to our work here at Age of Aces. But more importantly, he was our friend. Sid died on June 19, 2012. He left behind his wife of 50 years, Johanne, and three daughters. He also left behind a countless number of fans and people who have been touched by his friendship and generosity. While I have been reading Sid’s writings for many years, I didn’t meet him until 2007. I had contacted him to get permission to use some of his research on Robert Hogan for our first “Red Falcon” book. He not only agreed to that request, he would go on to help us on many of our other projects. Sid had been to many Pulpcons in the past, but it had been several years since he had attended one. When it was announced in 2008 that the very first Pulpfest would be held in Columbus I thought it would be great if Sid could get there from nearby Cleveland. I talked to him about it, and I offered to drive him there and back. He took me up on it, and in July 2009 I finally got to meet Sid in person. Of course when I got to his home, the first thing I wanted to do was see his legendary aviation and pulp library. But Johanne insisted that we have lunch first. She is an awesome person, and was incredibly kind to me on my visit. After eating, Sid led me up to his library. 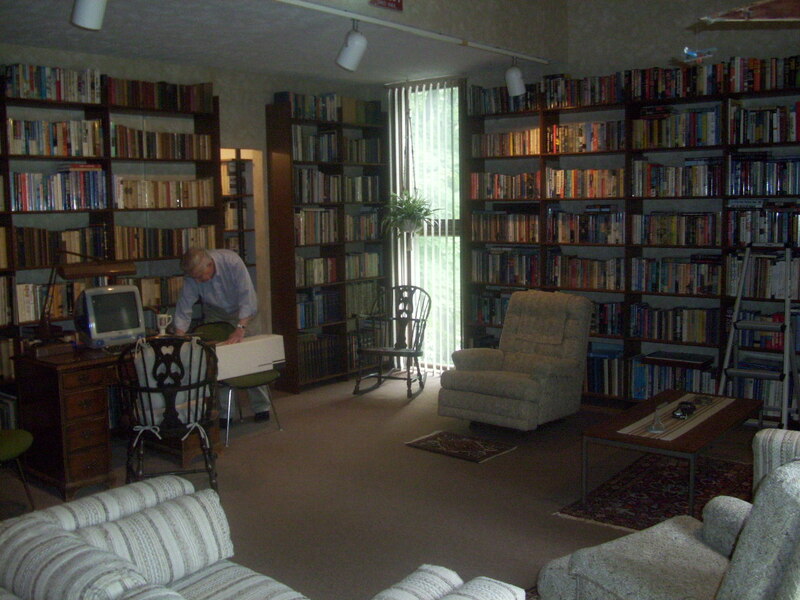 He had converted the entire second floor of his house into a place to hold his extensive collection of aviation books and magazines. Every wall was bookshelves from floor to ceiling. 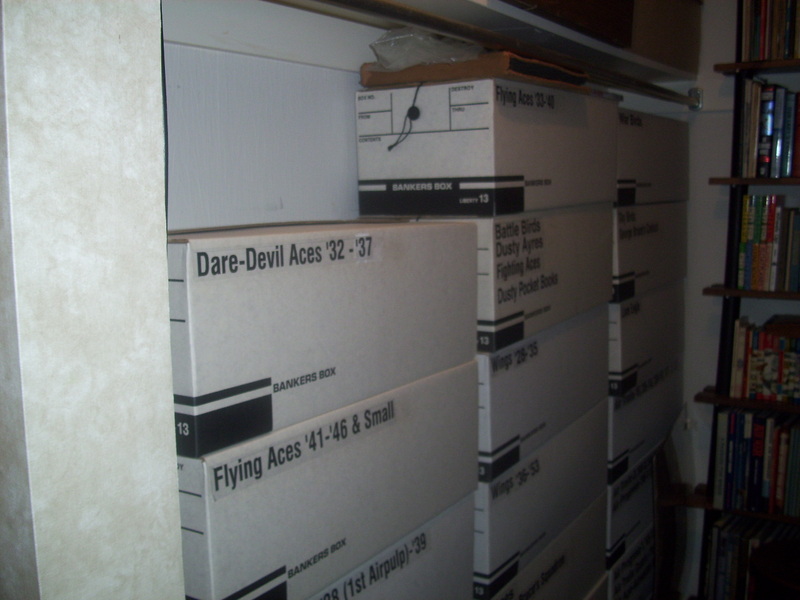 His pulp collection had its own separate room. They were all carefully bagged and boxed alphabetically. I couldn’t wait to start digging through them. The first ones Sid wanted to show me were his pride and joy, his complete run of pristine copies of “G-8 and His Battle Aces”. 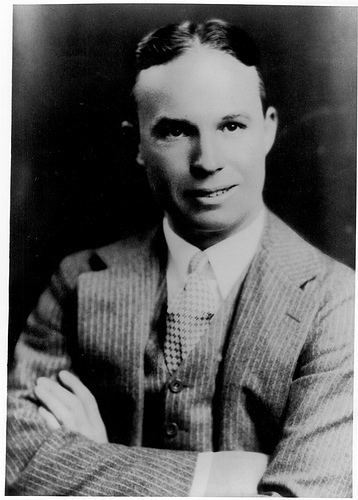 Sid explained that he had become acquainted with Henry Steeger of Popular Publications. When Sid mentioned to him that he wanted to upgrade his G-8 collection, Steeger gave him a complete run of unread G-8 magazines from his files. Steeger wasn’t the only pulp magazine legend Sid had known personally. He had also spent some time with Robert Hogan and Donald Keyhoe. In fact it was Sid’s urging that convinced us to publish Keyhoe’s “Vanished Legion” stories in 2011. Eventually I had to drag myself away from his library so we could drive to Columbus. That drive is something that I will cherish forever. For a couple hours, Sid entertained me with tales of his experiences around the pulp and aviation worlds. The time just flew by. We spent a lot of time together that weekend, and by the time I dropped him off at home Sunday evening, I knew I had made a friend for life. Sid seemed to really enjoy that trip, especially meeting all the Age of Aces crew. I know we enjoyed spending that time with him. Sid had another commitment and was unable to attend Pulpfest 2010. He and Johanne drove up to Columbus and he spent a couple hours one day at Pulpfest 2011. And they were both planning to attend this year’s Pulpfest, but sadly Sid left us before that could happen. After my first visit, Sid gave me an open invitation to come back any time. And the whole Age of Aces crew was planning a visit this year on our way to Pulpfest 2012. I did talk to him on the phone many times, but I regret not seeing him again. He was a wonderful person and a good friend. 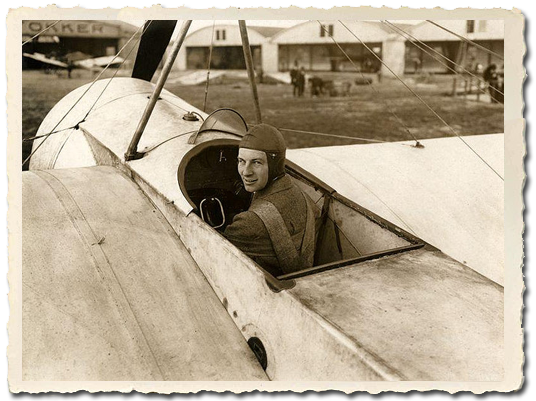 “Sid Bradd’s authority on aviation history, his inventive mind and inspiring life experience can never be replaced. He generously contributed his skills and expertise to our projects, and in so doing raised our standards higher than we had at first thought possible. Although we always thanked him in our “acknowledgements” we could never adequately express our gratitude for his reliable expertise, his inspiring encouragement and his warm-hearted friendship. If any of our future projects should happen to sustain a veneer of authority it will be primarily due to the lasting impact of Sid Bradd. Rest in peace Sid. We will miss you. Streaking swiftly through Hell skies, their three Hisso engines thundering, we find The Greatest Trio of Aces! 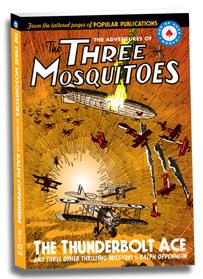 The famous and inseparable “Three Mosquitoes,” the mightiest flying combination that had ever blazed its way through overwhelming odds and laughed to tell of it, take off in four more exciting adventures from the pages of Popular Publications! Yes, Kirby, impetuous young leader of the great trio, lanky Travis, eldest and wisest of the Mosquitoes, and the mild-eyed, corpulent little Mosquito—“Shorty” Carn are all back and ready for action. This time up we have two tales from 1932 issues of Dare-Devil Aces and two from 1933 that were published in Battle Birds. If you enjoyed the pride and glory of the 44th’s last two books then you’ll surely want to pick up this volume. 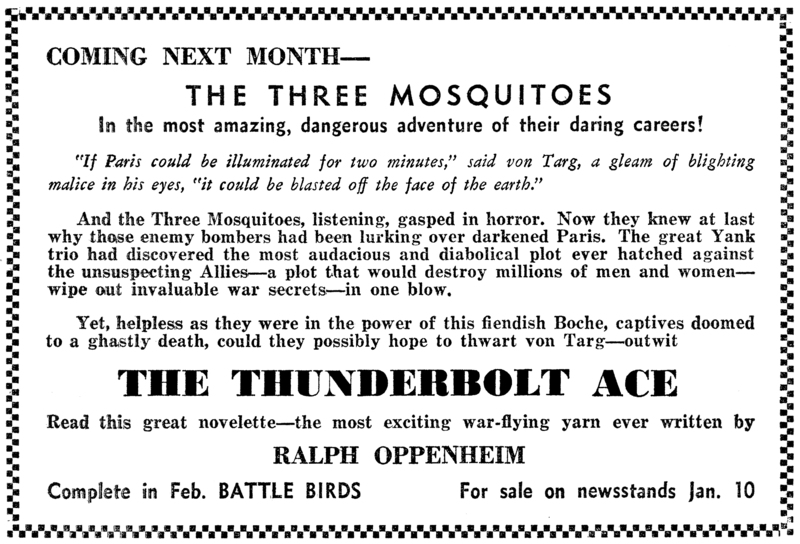 And if you are new to The Adventures of The Three Mosquitoes, what better place to start than with The Thunderbolt Ace! 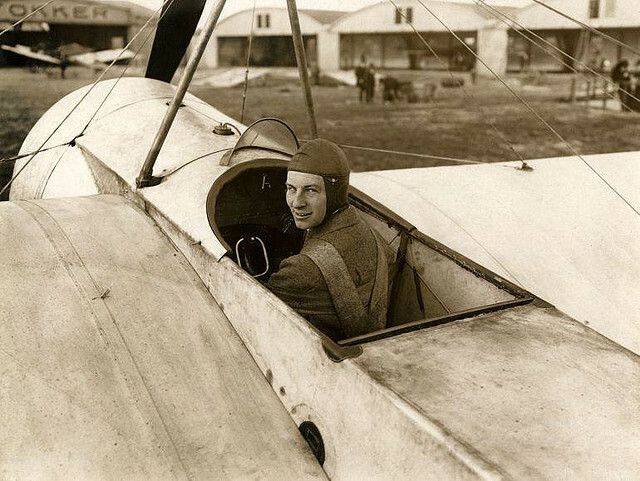 With the 39th installment of Alden McWilliams’ “They Had What It Takes” in Flying Aces, he chronicles the man who is maybe the greatest aircraft designer of all time—The Flying Dutchman himself, Anthony Fokker! Fokker was training as an automotive mechanic in Germany when he built his first plane—”The Spider”—in 1910. That plane was subsequently destroyed when his partner flew it into a tree. Fokker built another and managed to gained his piolt’s licence flying it. By 1912 he had started his own Airplane Company and quickly established a reputation for building some of the fastest and most stable planes flying at the time. One of the keys to his success is that he personally tested all the planes he designed and kept the pilot in mind asking their opinions on the planes. He sought out the advice of the men on the flight line and brought in the best engineers he could find. With the outbreak of WWI, Fokker’s designs were very much in demand and soon the greatest names in German aviation—Voss, Immelmann, Boelke and Richtoffen—were being cursed at while flying his planes. After the war he returned to his native Holland establishing a company there and later emigrating to America where his tri-motor planes helped establish the fledgling airlines and some of the great airplane records of the 30’s. Fokker unfortunately died at 49 in 1939 from pneumococcal meningitis after having been ill for three weeks. Alden McWilliams continues his look at the great airplane designers in his “They Had What It Takes” feature from Flying Aces. It’s March 1940, and this time we have Grover Loening. 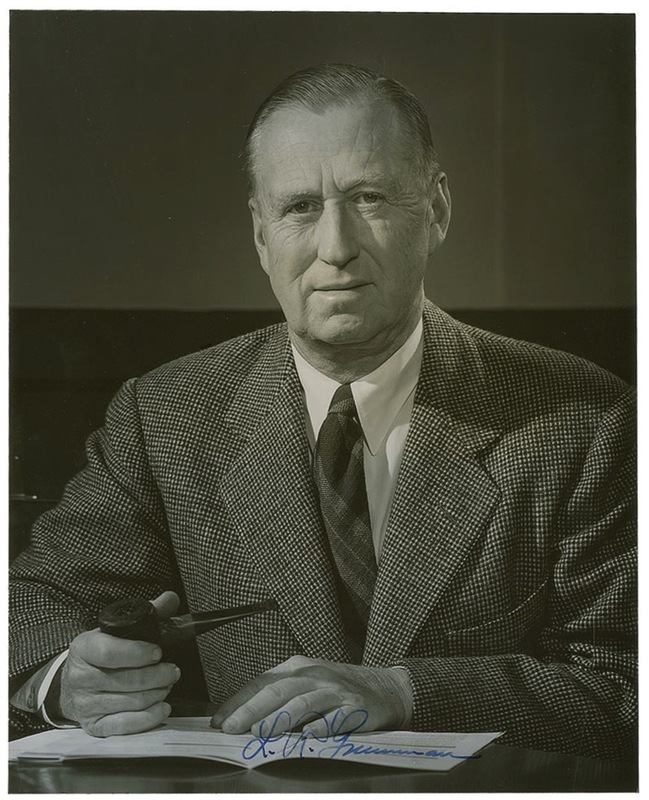 Grover Loening was a noted American aircraft manufacturer, who got his start as an assistant engineer to Orville Wright before starting his own company. He was known for test flying his own planes and at one time employed Leroy Grumman, William T. Schwendler, and Jake Swirbul who left to form Grumman. Of his many accomplishments, Loening was appointed chief aero-engineer for the Army Signal Corps in World War I and was chief consultant to the War Production Board, NACA and Grummand during the Second World War. Grover Loening lived to the ripe old age of 87, passing away in 1976. In this and the next few installments of Alden McWilliam’s “They Had What It Takes,” McWilliams turns his pen to those who designed the planes. First up, from the February 1940 issue of Flying Aces we have Leroy E Grumman (or Leroy R. Grumman as history records him). Grumman may have started out as a Navy flier, but he went on to become one of the leaders in Aircraft design and beyond. The company he founded in 1930 by mortgaging his house and pooling that money with several other investors would go on to build some of the key planes of WWII—The F4F Wildcat, F6F Hellcat and the TBF Avenger torpedo bomber. After the war the company continued to supply the Navy with excellent fighter aircraft like the A-6 Intruder in the 1960’s and the F-14 Tomcat of the 1970’s, but sought out new markets as well. They developed the Gulfstream series of corporate Jets and the Apollo program’s Luner Excursion Module (LEM) that landed astronauts on the moon! Grumman passed away in 1982 at the age of 87, but his company, which had been aquired by Northrop lives on as Northrop Grumman, one of the largest defence contractors in the world.